These vintage-inspired patterns and tutorials are a great resource for all things 1970s! No decade has been trending on runways as much as the 70s and it's easy to understand why. The 70s was one of the most interesting and most complex fashion decades around, with popular looks ranging from sweet homespun skirts and dresses to glittering disco glam inspired by celebrities like David Bowie and Cher. Colors like burnt orange, olive green, and dusty blue were all the rage in the 70s, as were long and sleek silhouettes made popular by bell bottoms and maxi dresses. If you love 1970s inspired clothing and have been looking for some great groovy sewing patterns, then you're in luck! Our list of sewing projects inspired by the 1970s is absolutely perfect for you! From long flowing day dresses that you can easily shake your groove thing in to fun and vintage-inspired accessories, these 1970s patterns and tutorials are a fantastic way to embrace the past while keeping a modern edge. We've made sure to include ideas for flirty fringed bags, 70s inspired dresses, and even some cute tutorials for kids. Take a journey through time back to the days of feathered hair and lava lamps with this list of dynamite 1970s inspired sewing projects. 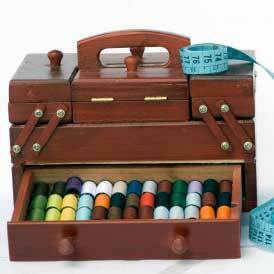 Want even more great vintage-inspired sewing projects? Then you'll love our huge list of retro sewing patterns inspired by every fashion decade you can imagine! If you love everything about the 1970s, then you're sure to fall head over heels for these vintage-inspired sewing projects. We've made sure to hit all the major fashion trends from the 70s, from bell bottoms to flowing dresses to flirty tops. Be sure to let us know which of these projects is your favorite in the comments! The 1970s were all about long silhouettes with clean lines, meaning flowy maxi dresses were hugely popular. Wrap dresses also became popular in the 70s due to fashion designer Diane von Furstenberg and her wrap dresses worn by celebrities like Cybill Shepherd and Ali MacGraw. These 70s inspired dress patterns are the perfect way to combine vintage and modern style. Rhiannon Upcycled Maxi Dress Tutorial - Channel Your Inner Stevie Nicks! Bohemian Rhapsody Wrap Dress Pattern - Brand New! Fun and Flirty Wrap Dress - Reader Fave! One shoulder and halter tops were incredibly en vogue in the 1970s and were made popular by movies like Saturday Night Fever and disco culture. The perfect mixture of flirty and classic, these DIY tops to sew are the best way to translate fun vintage style to the fashion trends of today. Silk Scarf Shirt - Super Flattering Shape! Stunning Lace Sweater Refashion - Can't Forget Classic 70s Details! Oh La La Tank - Great for Warm Summer Days! Fabrics like denim and prints like chevrons and florals were everywhere in the 70s, including fabulous DIY accessories like these projects below. Whether you're searching for a vintage-inspired hat, purse, or other fun accessory, you can't go wrong with these easy sewing projects! Fabric Wrap Belt - Wear with Your Favorite Long Dress! Ali MacGraw Cloche Hat Pattern - Because You Love the Movie Love Story! 3 Hour Kimono Pattern - Inspired by 70s Rock Goddesses! If you're searching for even more great 70s inspired patterns, you've come to the right place! These 70s sewing projects include playful ideas for kids, like baby bell bottoms, as well as other vintage projects like fun refashioning ideas. Your journey back to the trendy looks of the 70s is only a few stitches away! 70s Bell Sleeve Top Refashion - We Love This! DIY Sleeveless Vest or Jacket - Perfect for Fall and Winter Wear! 15 Minute Lacy Blazer - Menswear Inspiration + Lace Details = Totally 70s! Looking for more inspiration from your favorite fashion decade? We've rounded up the top 10 fashion trends from the 1970s, from style inspired by celebrities like Cher and designers like Halston to day to day wear that was your go-to outfit. Journey back to the groovy 70s to find your favorite vintage look. Halston - Fashion designer Halston was known for his disco-inspired gowns and dressed celebrities like Elizabeth Taylor and Liza Minelli. He first became famous in the early 60s after designing Jackie Kennedy's signature pillbox hat worn during JFK's inauguration. During the 70s, Halston focused on creating sophisticated and minimalist clothing, and often created clothing cut on the bias, to challenge the stiff silhouettes of the 1950s and early 60s. Known for creating simple, draped gowns and his signature halter dresses made with jersey, Halston was also a pioneer in bringing high fashion to the masses. He was one of the first fashion designers to collaborate with department stores chains, joining forces with JC Penney to design high fashion for lower prices. Earth Tones - Unlike the bright and psychedelic patterns of the 1960s, the 1970s saw a shift to neutrals and earthy tones in clothing. Colors like olive green, burnt orange, sienna brown, and denim blue became common in everyday clothing. The idea of creating a luxe and simplistic color palette became popular by the mid 70s. Cher - The embodiment of Studio 54 disco fashion, Cher, along with other icons like Diana Ross and David Bowie, brought disco glam to the masses. Often partnering with designer Bob Mackie, Cher's style of bright colors, loud sequins, and flowing long hair cemented her as an icon of 70s fashion. Suede and Denim - Along with a shift to neutral colors, simple and soft fabrics also made a comeback in the 70s, with two popular fabrics being suede and denim. With the rise of bell bottoms in popularity, denim became common daywear for men and women, especially with teenagers. Suede was used on accessories like bags and belts, along with skirts and dresses, and gave clothing an expensive but simple style. Saturday Night Fever - One of the most popular films of the decade, Saturday Night Fever made fashion like bell bottoms, leisure suits, dreamy and drapy dresses, and platform shoes staples for eveningwear. Inspired both by the film and the Bee Gees, disco clothing provided an alternative to simple daywear. Romantic Fashion - Soft and romatic fashion popular in the 70s acted as a sharp contrast to the earlier counterculture movement of the 1960s. Popular with designers like Laura Ashley, romantic fashion trends included Victorian inspired high necks, ruffles, delicate floral prints, eyelets, luxurious fabrics, and embroidered details. Ali MacGraw in Love Story - Another hugely popular film of the 70s, Ali MacGraw's character in Love Story became a style icon of classic American sportswear. The perfect example of clean-cut, preppy fashion, MacGraw sported trench coats, simple silhouettes, and lots of gorgeous fall clothing. The Rise of Punk - In direct rebellion of disco, punk burst onto the music scene in the late 70s. Fashion designer Vivienne Westwood and Blondie frontwoman Debbie Harry led the rise of punk fashion, including smoky eyes, tousled hair, and lots of alternative clothing. Farrah Fawcett's Iconic Hair - Perhaps one of the biggest fashion trends to come out of the 70s, Farrah Fawcett's signature feathered and flipped hair was emulated by fellow celebrities and teenage girls alike. Her red bathing suit from her famous 1976 poster is now owned by the Smithsonian and was designed by Norma Kamali. Midi Skirts - Midi skirts are currently having a major moment on runways, but they first became popular during the 70s. While mini skirts remained popular in the early 70s, hemlines slowly dropped as both midi (hitting mid calf) and maxi skirts became more popular as the decade continued. What do you love about 70s fashion? Be sure to leave a comment below! I feel like there's a right way and a wrong way to do the '70s. These patterns are the right way! I especially love the dresses and skirts. I like that these patterns don't look like costumes. They look like clothes people now would actually wear.